By The Lake. In Olympic National Park. Historic Lake Crescent Lodge built in 1916 as Singers Tavern in Olympic National Park serves as an ideal base camp for the variety of recreational activities in the park while allowing you to experience the charm of a turn-of-the-century resort. The comfortable spacious guest rooms are nestled among the giant fir and hemlock trees on the shore of beautiful Lake Crescent and offer wonderful views of the lake. The simple elegance of yesteryear in the antique furnished lobby is conducive to relaxation as you unwind by the stone fireplace and the wicker-cozy sun porch is the perfect spot for enjoying a spectacular sunset over the lake. A variety of guest rooms are available at Lake Crescent Lodge including the historic lakeside Roosevelt Cottages to make your Olympic adventure exciting but restful. Explore the wonders of Olympic National Park while enjoying the comforts and traditional hospitality of this Historic Lodge. 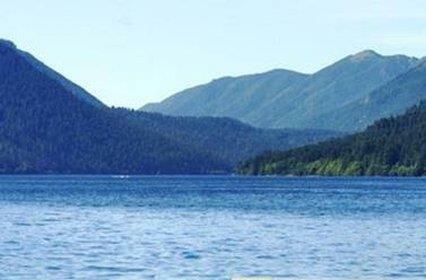 Nestled in the northern foothills of the Olympic Mountains Lake Crescent lies about 18 miles west of Port Angeles. The pristine waters of this deep glacially carved lake make it an ideal destination for those in search of natural beauty.